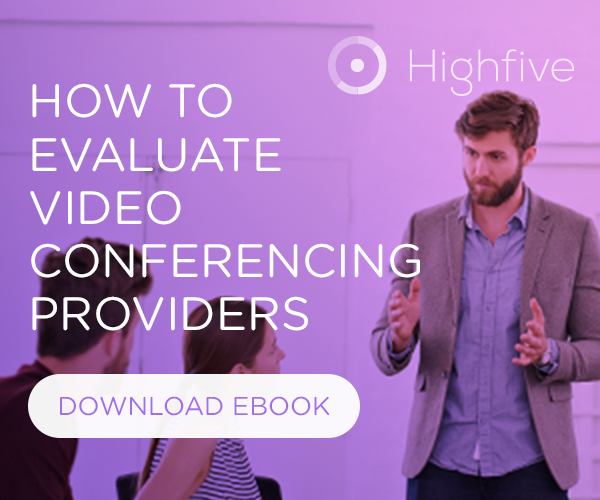 You've figured out how to use Highfive for your own meetings. *Highfive! * The next step in creating a video connected culture is to share your wins with the people closest to you. In our experience, using a balanced, top-down and bottoms-up approach is an effective way to get your entire team onboard and using Highfive for their daily work. An easy grass-roots approach to getting your team onboard is to continue exposing Highfive simply through meetings you already have with them. As you start selecting more meetings to use Highfive for, put more weight towards those with other team members. During those meetings, be an advocate of going face-to-face and help colleagues get set up Highfive for their own meetings. A grass-roots approach to driving team wide adoption is effective but a top-down approach does make a significant impact. One key method to getting your team onboarded quickly, is to get sponsorship from your team lead. Their buy-in will help break down adoption barriers from the team and at the very least will drive others to explore the technology. Another top-down approach is to expose Highfive to the entire team at once. A good way to do that is to host a kick-off where you can both discuss Highfive in detail and also get team members started. Ask your team lead to recommend Highfive to the rest of the team via email, the next team meeting, etc. Get Each Team Member Working Like You! Essentially, we want each of them to go through the same journey you did in the previous article: Start using Highfive for your meetings. The more meetings each member integrates Highfive with, the closer your team is to using Highfive for daily work! As your team begins using Highfive more and more for daily work, it's important to also help optimize their experience and continue supporting/enabling them through their own journey.